There will be a talk back with the playwrights directly after the Sunday matinees. Attempting to drive to summer camp, a family is led astray by their GPS and into a challenging situation. While Matilda is sitting Shiva for her beloved nine year old companion, an unexpected visitor gives her the courage to make a life-altering decision. Without insurance, after suffering a nervous breakdown, John James is forced to take a leave of absence from the church where he’s been rector for 25 years and convalesce in an unusual place. After reviewing his life and having several visitors from his life he decides there’s a sure-fire way to go out on a high note, and puts his idea to the test. 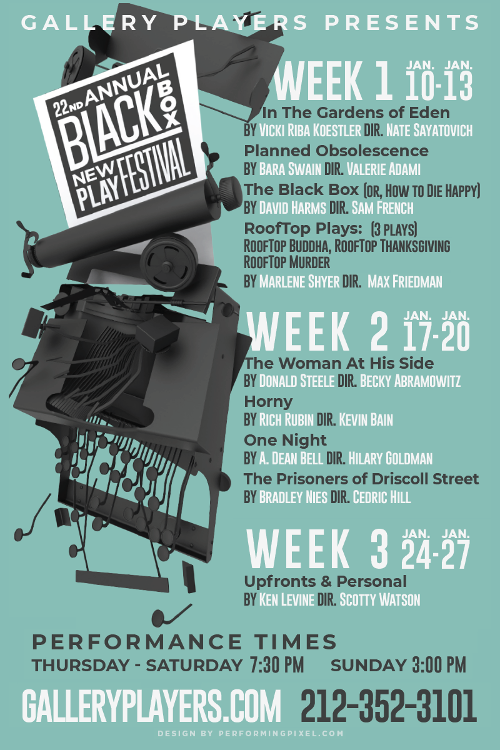 A series of three ten minute plays set on a rooftop in a city. From murder for real estate, to memorials, to divvying up holiday attendance, you never know what is going on over your head. What happens to a relationship when a long married couple competes in the same field? Mickey and Frankie are two small-time con artists who’ve just come up with a new scheme involving, among other things, the large mammal exhibit at the American Museum of Natural History. Dmitri is a love-sick Russian mobster with an entrepreneurial spirit, a satchel full of cash and a bad temper. What could possible go wrong? Two college roommate unravel what happened one night that could change their lives forever. One Father’s Day, Fred and Edwina Rogers, an elderly couple from Houston, Texas were murdered. This play depicts a possible altercation between a mother and her son, a son who may have murdered both of his parents. The process of getting a TV show on a network schedule is examined as one studio attempts to place two sitcoms on the fall line-up. How far will everybody have to go, what compromises must they make, which ethics will they have to abandon? And yes, it’s a comedy!